There are several different types of home smoke alarms available for residential and commercial use. This type of alarm is specially designed to sense the particles that are produced when one type of combustion or another occurs in a given area. The particles that the alarm detects may be visible to the naked eye or invisible. Once the particles have been detected by the alarm system, it is designed to emit a sound that is distinguishable to those within the range of the sound. In some instances, a light may be activated that flashes or blinks on and off. These alarms are considered to be the front line of defense when it comes to protecting human life and even property. Typically powered by batteries or electricity, these devices save a large number of lives annually. The first type of alarm that is used to detect the presence of combustible materials is referred to as the "Optical" unit. This is a light sensing device that implements the use of a beam of light produced by either a LED that is infrared based or incandescent in nature. In addition to this, a special sensor is configured into the alarm. Once smoke or other particles are detected, the alarm is immediately triggered. These alarm types are quite effective in commercial and community settings such as large stores, or an auditorium. Seeing that many alarms that detect smoke are quite sensitive, this alarm is often referred to as the "Toast Proof Smoke Alarm", as it is not as sensitive at all. The second alarm type when it comes to home smoke alarms is the one that is referred to as "Ionization". This type of alarm is commonly used in homes and is appropriate for those that are seeking inexpensive models. However, there is a downside to purchasing this type of alarm. That is that they are highly sensitive. It is not unusual for them to go off during cooking and other activities that are similar in nature. Smoke emitted in the area of the alarm enters in to a special area of the alarm called the "Ionization Chamber". In this, there are two small electrodes that maintain a specific current. 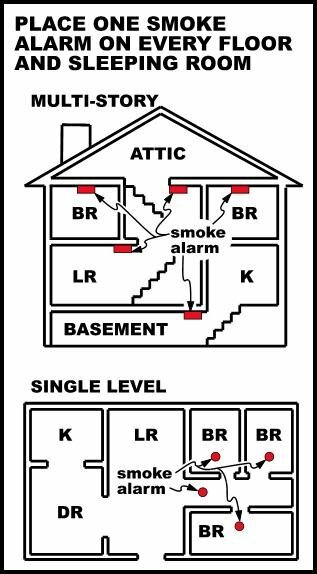 If smoke enters, it interrupts that current and the alarm is sounded to warn individuals that smoke has been detected. The third type of home smoke alarms that can instantly detect particles emitted from some type of combustion is referred to as "Air-Sampling". This is often used in commercial and industrial settings as the alarm implements the use of piping and similar types of products that help take air from one location to the location of the alarm in order to determine if there is an area in a building or other location that contains combustion based particles. Tissue converting plants such as Georgia Pacific and computer server warehouses often implement the use of this smoke alarm type. It is important to understand that smoke alarms can effectively protect property as well as people. Whether you need one for a residential area, commercial area, or even for an industrial area, it is essential to choose among the available types to determine which model would best serve your needs. Throughout this guide, you have been introduced to the three most common models available on the market today.